Today we are talking about... Adapting To Change!!! Strategize ahead of time for opportunities that may arise. Get feedback on your plans. Then Refine. The ability to see exactly how you spend your time. No data entry, no effort-- Your time gets tracked down to the second without you having to actively track it. Instant and easy time-management analytics. Instantly know how much time you’re spending on a particular app (like “Microsoft Word”), site (like "Google.com") or a category (like “Communication”). The ability to set time management goals. It may be hard for an egg to turn into a bird: it would be a jolly sight harder for it to learn to fly while remaining an egg. Change might be uncomfortable, heck it's probably scary... you might be comfortable or happy with how things are. And often change can come with setbacks. But if you never adapt to the changes in your business, in your industry, or in your life... you will be unsuccessful. Because change is going to happen... no matter if you want things to change or not. Change will happen and those who adapt early will far outpace those who struggle and resist. 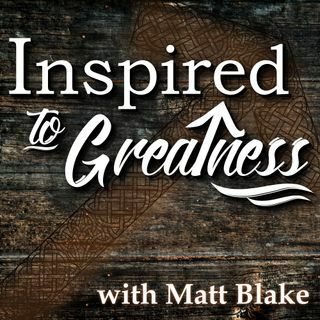 Thanks for joining us on Inspired to Greatness, please check back with us each and every week for fresh tips and new guests. Visit our website at ITGPodcst.com and Look for us on Spreaker, iTunes, iHeart, and Spotify…. Thanks again, my friends… Go do amazing things, be awesome, Go Inspire, Motivate, and Dominate! AND Be The Bird!